Start decorating with fun, flirty and fabulous hoops-shaped beaded curtains in festive colors at ShopWildThings. The colorful hoops with cutout centers are made of flexible, lightweight PVC material. Each curtain is 35 inches wide and 78 inches long. Each curtain rod holds 7 strands of big, bold hoops in two sizes: 2.5 inches and 4 inches. Click on our great photographs of these colorful hoop beads curtains in use as backdrops for stage sets and as background or door curtains for parties. Choose bright blue, silver and black or pink and lime color combinations. We also have hoops beaded curtains in blue and lime, purple hues and multi-color rainbow styles. 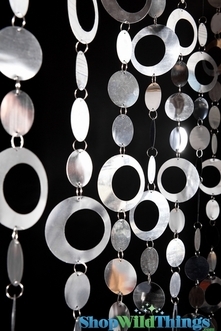 Because each hoop is connected with a jump ring to the next, one client added length to her original curtain by purchasing a second curtain. The cutout hoop beads from the extra curtain were added to the original curtain with the extra jump rings. Transform a bedroom with our Megan edition of our 3-piece Room in a Box series. The Megan set has a fuchsia bed canopy, lime green chandelier and pink and lime beaded hoops curtain. The mosquito netting canopies included with these sets also make a great focal point when hung over or around cake tables at a wedding celebration. They're terrific in use in playrooms or outdoor celebration spaces. Curtain dimensions: 35" x 78"